R.J. Palacio's new children's novel, Wonder, is making a big splash at the moment, and it's not hard to see why. The 10 year-old central character (and the first of several narrators), August Pullman, has a rare and extreme genetic facial disfigurement, and we join the story as he faces into his first school (he has been home-schooled so far). In the first paragraph, he tells us: "I won't describe what I look like. Whatever you're thinking, it's probably worse" (later, another of the narrators, his sister Via, does give a vivid physical description of a face that looks as if it's been badly melted in a fire). The story that follows rips along, tugging plenty of emotional strings as Auggie faces this new world. As Auggie tells us "It’s like people you see sometimes, and you can’t imagine what it would be like to be that person, whether it’s somebody in a wheelchair or somebody who can’t talk. Only, I know that I’m that person to other people." 'Faces' is always the appropriate metaphor here. Eliot's anxious J. Alfred Prufrock says that "There will be time, there will be time / To prepare a face to meet the faces that you meet", but nothing Prufrock has to face comes anywhere near Auggie's daily challenges as he heads out daily from a very loving cocoon of a family (including the dog Daisy), and no-one he meets has the time to prepare a face responding to Auggie's (almost everyone flinches, and he always notices). Hallowe'en is the best time of all: Auggie can wear a mask like everyone else and be free of the mask that is his own face. And 'face' is also a metaphor that will chime with young readers; central to childhood and adolescence are uncertainty and self-consciousness, and the difficulty of fitting in. Palacio takes her readers skilfully through the ups and downs of friendship ("nothing tests friendships like high school"). The blurb says that (cue gravelly voiceover) "in a world where bullying among young people is an epidemic, this is a refreshing new narrative full of heart and hope" - as crass and badly written a description as you could hope for. 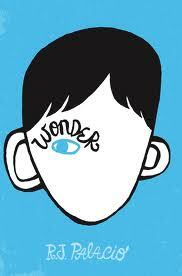 Wonder is better than this, with a powerful examination of identity - how we are seen, how we see others. However, it does point to a fault some may find: the arc of the story turns out to be somewhat predictably one of triumph over darkness, with perhaps too many saccharine markers, and some of the later narrators are not always as interesting as Auggie or Via (such as her boyfriend Justin, and his friend Jack Will). But these caveats are likely to be a long way from the minds of young readers who will be cheering through their tears by the end.